C.I.S. - Charlotte, NC's Source For Home Technology Answers! Hulu has debuted its much-anticipated Hulu Plus, with an invitation-only preview of the $9.99 monthly subscription model, for access on a range of devices. You may be a big fan of popular web video service Hulu, but are you a big fan of paying $9.99 a month for it? The streaming service debuted its Hulu Plus upgrade, which has been in the works and rumor mill for a bit. The service is being offered for starters as an invitation-only preview. From your reaction in a poll on Electronic House last month, the verdict is still out on whether or not you’ll bite—when asked “Is $10 too much for Hulu Plus?” 42 percent said yes, only 20 percent said no, and 38 percent said it depends on the content. Well, for starters the content is said to be expanded catalogs of television shows, past and present, from the libraries of NBC, Fox and ABC. That means “season ticket” access to full seasons of current hits like House, Family Guy, The Office and Grey’s Anatomy, in high-def. It also means full seasons and full series of older favorites like The X-Files, Arrested Development, Miami Vice, Quantum Leap and Ally McBeal. 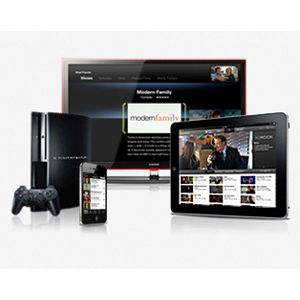 Plus members will also be able to access all of those shows from multiple devices. Samsung will carry Hulu Plus as one of its Samsung Apps as the exclusive invitation preview provider for connected TVs, with availability on most of its 2010 models of 40-inches and larger. 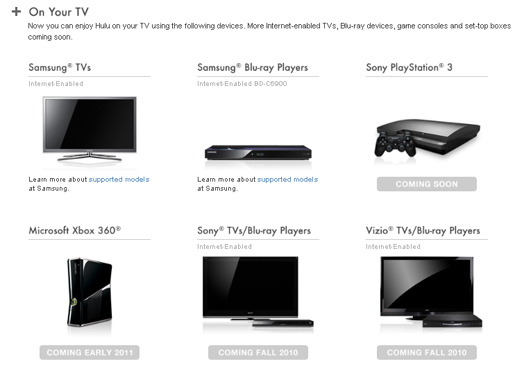 The service will also be accessible through Samsung Blu-ray players and theater systems, Apple’s iPad, iPhone 3GS and 4, and iPod Touch, and “coming soon” Sony’s PlayStation 3, TVs and Blu-ray players, Microsoft’s Xbox 360 and Vizio TVs and Blu-ray players. Custom Installation Services, LLC - Charlotte ’s Home Theater & Technology Experts! It’s easy to get swept back into the world of analog by adding turntables and a slew of cheap records to your audio rig. This website is usually for discussing new technology. Recently, though, I rediscovered an old technology that still qualifies as new for many readers, and one that I can’t recommend enough as an addition to your audio system, especially if you consider it mid-to-high end: vinyl. A Sony turntable I bought 10 years ago served me well at the time but had long been removed from my theater system when I got lazy about replacing its bum needle. Plus I’d become enamored with surround sound. But thanks to some electronics and speaker upgrades, and reading constant vinyl evangelism from Stereophile’s thirtysomething (my age) blogger Stephen Mejias and his “Elements of Our Enthusiasm,” the analog bug began biting again. But aren’t turntables, cartridges and needles the kind of pricey gear that only so-called “audiophiles” invest in, you’re thinking? Yes, there are many types of ’tables, and cost can quickly escalate well into the thousands. This time around, I figured I’d start at the very entry level. After a $50 Technics turntable find on Craigslist and $100 Cambridge Audio phono preamplifier purchase (you’ll need one if your processor or receiver lacks a phono stage), I wasn’t into the vinyl experiment for much money. Plus, there are several respectable turntables in the sub-$400 range should I decide to upgrade. In fact, Mejias moderates the Stereophile forums, including an “Entry Level” thread with a sticky post called “Since this comes up a lot. Turntables under or $1,000” with all kinds of great turntable suggestions. As much as I enjoyed spinning records 10 years ago, the analog epiphany really cold-cocked me this time. Perhaps my job as a custom electronics writer/editor has given me a greater appreciation of sound quality (especially when it comes to hearing demos at tradeshows), but listening to old LPs through this new setup was nothing short of nirvana. It didn’t matter that some albums crackled more than Rice Krispies—the instruments also snapped and popped a whole lot better, too. Even while lacking the “golden ears” of some reviewers, it was easy for me—and my wife—to hear the differences between CD and vinyl versions of songs. The vinyl soundstage was wider, instrumentation was more defined, bass was tighter, hi-hat drum cymbals were thicker and livelier, and dynamic range was fuller. “I wonder if more people would the like music they say they hate if they listened to it this way,” my wife said after I forced Yes’ prog classic Roundabout on her. And record hunting is almost as fun as record playing. I’ve bought LPs purely for the artwork; some include fancy lyrics booklets; Bookends came with a giant Simon and Garfunkel poster! You can discover gems at flea markets, tag sales, the Salvation Army and, if you’re fortunate, a local record shop. 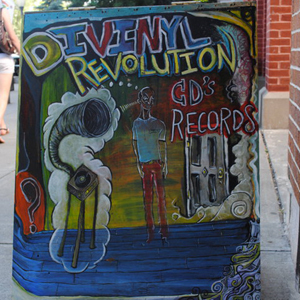 At Divinyl Revolution in Saratoga Springs, N.Y., this weekend I picked up 14 albums for $24.99, the majority of which cost $1—or the equivalent of a single, compressed song download from iTunes. Not to mention that when I went to the Craigslist seller’s home to pick up the turntable, he gave me a small stack of records, including perhaps the most listened-to LP of all-time, Pink Floyd’s Dark Side of the Moon, with a sweet Dark Side pyramids poster up its sleeve. How’s that for good karma? We know records have been making a comeback in recent years, to the point where Best Buy has added shelf space for vinyl and artists are appealing to younger-generation listeners by releasing vinyl albums that include free digital downloads of the same in MP3 format. I’ll look forward to visiting again next summer. C.I.S. is Charlotte NC's Source For Lutron RadioRa2 Sales & Installation! The MXC touring the U.S. from lighting manufacturer Lutron features solutions for lights, shades, energy efficiency and home theater. As a leading lighting control manufacturer and pioneer of the dimmer, let’s just say Lutron Electronics is always full of bright ideas. 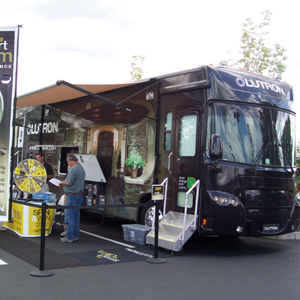 The company’s latest is rolling along to a city near you to—it’s an RV dubbed Lutron’s Mobile Experience Center (MXC) used to, ahem, enlighten people about the benefits of lighting control, whether it be as an enhancement to their home theater, a convenience, an aesthetic improvement, or a way to increase your home’s energy efficiency. The MXC tour has expanded from five cities in its debut last year to 12 this year—the 43-foot vehicle has made its way from California to Florida to Georgia to North Carolina and is wrapping up in the Boston area this week (click here to check out the dates and locations). It’s scheduled for stops in the New York area, Indianapolis, Pacific Northwest and Northern California to fill the second half of the year. Mainly people have been able to find it sitting in parking lots outside of their local Lowe’s and Home Depot home improvement stores, though it’s also hit events such as golf tournaments and a Monday Night Football game during its two tours, along with lighting showrooms, electrical distributors, and A/V dealers and distributors. Custom Installation Services, LLC - Charlotte ’s Home Theater & Technology Experts and Your Place For Sales & Installation Of Lutron Products!